At last, a finished anything! Above is the latest knit dress in the wardrobe, Vogue 1194. I wanted to try this one as soon as I saw it in the fall patterns. It’s basically just an empire knit dress with a twisted band under the boobages (as if boobages weren’t interesting enough on their own). I also got a hot burning feeling to make it the red that was shown on the pattern envelope. I don’t know why, but there it is. I had no suitable red fabric stashed so I bought some rayon/spandex at Discount Fabrics for about $3.50/yd. Rayon/spandex is not the easiest fabric with which to work. It moves and stretches on you, plus every needle hole shows. It’s a think twice and sew once fabric, since ripping out is obvious in the fabric. That said, it’s super comfy to wear so it’s worth the extra effort to me. My red dress is pretty true to the pattern. I omitted the side pockets because my material is very drapey and they would look too lumpy, and I made the sleeves 3/4 length to my personal preference. 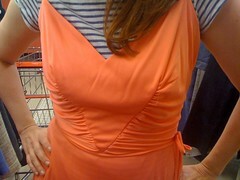 After trying on the dress I raised the front neckline about 1.5″. I wanted a more “day” look and also this fabric stretches lengthwise when worn and that made the neckline lower some too. With a more stable knit you may not need to make that mod. That’s pretty much the story, though I should have finished with this yesterday. Sadly, I cut into one of the sleeves when trimming one of the sleeve hems. Gulp. I just cut off the sleeve hem where the hole was and added bands at the bottoms of the sleeves. No harm done, but I’d lost my gumption to finish the dress off. It’s best not to push through, since that’s when I tend to make dumb mistakes. Now I just need to get that 80s song “Lady in Red” out of my head….argh! …that there is rocket on the top of a building in Kansas City? We wondered why when walking by the thing on the way to a fantastic bbq dinner. Well enter the google machine and mystery solved. Former TWA headquarters. It’s simple once you know. Actual crafting content should be ready tomorrow, barring any more scissor accidents. Today’s hotel room view courtesy of downtown Indianapolis (or today Windyanapolis). Why, you ask? Uh, they’re GNOME MITTENS! How stinking cute are they? Would I have gnomes in the yard or wear a gnome Halloween costume? No. Gnome mittens? Sign me the freak up! Plus, it’s good practice for my upcoming Norwegian yoke sweater. I don’t do much colorwork, so these mittens will give me some practice to get my tension less wonky. My gnomes will forgive wonky tension. They’re good like that. Ok, Leia is done and can be mentioned on the blog. I’d wanted to make this after seeing it done beautifully by Yoshimi and then again by Novita. Both ladies made lovely versions that got me motivated to sew Leia. Leia is a pdf pattern from Tamanegi Kobo. I’ve never used a Japanese pattern before, but will not hesitate to to so again. If Leia is any indication, the instruction drawings are plenty good enough to get the idea of how to proceed. The Leia pattern is also a layered pdf with different sizes on different layers. You can hide the sizes you don’t want and just print out what you want to use. No tracing off nested patterns here. So easy and a great idea. 1. I bought the pattern, uploaded to the Fedex Kinkos local to me and they printed it off on legal paper, NOT SCALED to fit. Japan uses A4 paper which is slightly larger than 8.5 x 11, so I opted to use legal size to make sure I got everything on each page. This costs under $4 and saves me having to buy legal paper and doesn’t use up the ink in my old injet printer. 2. Taped the pattern together and cut out the pieces. Very easy, there’s a diagram on the pattern itself and every edge is marked. 3. Decided to make the largest size (42 in this case) since I wasn’t really sure if seam allowances were included on the pattern. I think they are, but if they aren’t better have it bigger and make it smaller, right. There was a chart of finished dress measurements, but I don’t think my finished measurements are the same as those. The size 42/Japan 13 is confusing too as a 42 is about a US 12 and Japan 13 is a US 10. The finished bust of this dress fits me perfectly and I’m a 34 bust. There’s no way a 36 bust is fitting in that top. The hip measurement wasn’t important since this is a pretty wide A-line dress. 4. Sewed Leia up following the diagrams. Since I assumed the seam allowances were included, I used the seam allowances noted on the pattern. This pattern uses several different SA widths, all of them much narrower than our standard 5/8″ in the US. I actually love this because you don’t have to trim each seam. Of course, that also means you don’t have as much margin for error where fit is concerned. The choice of fabric is also important to make that curved yoke work. My fabric is a stable rayon/cotton that presses well and doesn’t unravel. I wouldn’t want to use a polyester georgette or crepe for this. That would be super hard. But in rayon or cotton, no problem with the curves. I didn’t alter the pattern at all and it fits pretty darn well. I’m a 34 B/C bust with broad shoulders and this bodice fits me perfectly. The “waist” of the dress fits me as an empire since it’s about 1.5″ to 2″ above my natural waist. I’m not long waisted so I assume this is what the designer had in mind. I did a turn/turn hem about 1.25″ total depth rather than a blind hem, that’s my only mod 🙂 I did cut my fabric on the cross grain, rather than the lengthwise to make the stripes more flattering. So that’s my Leia adventure, and the resulting dress is easy and wearable. I’d not recommend Leia for a beginning sewist unless you had someone to explain the steps to you. But for the more experienced, I say give it a try. In an attempt to banish the thought of orange Qiana from your collective minds, we will think of something else. I began Leia today using fabric from the stash. For those who remember me lamenting that there was no suitable stash fabric available, I was wrong. I took it upon myself to reorganize my fabric stash into two plastic storage containers, sorted by type of fabric (OCD much?). When I did so I came across some rustic cotton/rayon (?) that would work splendidly. The only drawback to this fabric is that I will have to use it on the cross grain rather than the lengthwise grain. Why? Because I refuse to wear a dress with horizontal stripes, hence the change of grain. So far I’ve had no problem with the verrrryyyy curvy front and back yokes. They just need a lot of staystitching, clipping and pins. I also chose to use a fabric that loves being ironed into shape. Some poly georgette would probably kill me. I should be done with Leia by tomorrow, so I shall see if it’s a wearable dress when all is said and done. I’m hopeful but have tempered my expectations. If it’s a win, I’ll share. If you never hear of it again, think of something else. Can you believe my friend didn’t let me buy this at the thriftstore? I know! 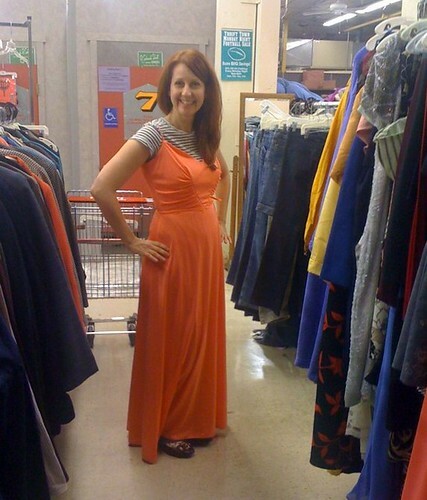 It’s a never worn orange Qiana gown that fits perfectly over two tshirts and a pair of jeans all for $16! I wanted to wear it everywhere, yet the voice of reason put the kybosh on this purchase. What this dress does have is an interesting bodice. There is a waist seam, so I’m guessing you’d rotate the darts to the CF and slash and spread the shirring. An interesting idea from the dress I couldn’t have. I wanted to start Leia, but all the material in the stash was either unacceptable to there wasn’t quite enough of it. Argh! Maybe I’ll make Leia into a blouse/tunic out of some stash. That way I can practice the sweetheart neckline facing and have a cute blouse out of it too! the perfect dress, originally uploaded by redsilvia. Here is the knitting equivalent of a to do list. Mine is called the pile. These are projects that will vie for the available knitting time. The yellow area is Maia, an almost finished Maia it must be said. If my memory serves me correctly, I could probably have that little shawl done in a day or so. Hmmm. The pink blob is one almost complete Azure sock which actually has a deadline of next week to make is NON belated birthday gift. That may become my priority knit for the next few days. The small gray thingy is some ribbing for my version of Drops 116-9. My version will be a pullover with long sleeves, but I love that Norwegian pattern for the yoke, so that’s staying. I’m making up all the other bits of the pattern and sadly those are still in my head. This one may take awhile. Those are just the knitting tasks. There are so many more things to do when one comes home after a couple weeks of working neglect. Maybe I should become a list maker? Or an insomniac? Both unlikely. But stay tuned, something’s going get made around here. I won’t even tell you how much I’ve been working. I am home on a layover due to some nifty swapping, so I get to sleep in my own bed and wash my uniforms. My passengers will thank me for that one. Despite working every darn day for 12 days, I did manage to start some socks for a friend’s upcoming birthday. I chose the Azure pattern from Knitty and some delicate pink yarn (Lorna’s Laces Shepherd Sock in Whisper) to make achingly pretty socks for my friend who literally has everything. I’m even making them toe up (not my fave method) since I’m too tired to adjust the pattern. AND I don’t care if you don’t need wool socks in Los Angeles. Someday it will be cold there. Someday. Five more days and it’s a week off. I’m itching to sew up some last of summer clothes, so I must keep ahold of that during the next few sleep deprived days. Cheers!